Case studies from DeepSky Marketing. Some examples of how DeepSky Marketing has helped companies succeed. The Switch could have been competitive in the open market except for one big drawback: it did not have doors, or a body. Unfortunately, funding had run out and the Switch Electric Vehicle (EV) was a safe but not-finished-looking roll cage on wheels. We researched the hobbyist/maker market and determined it was too small to build a business around. Also, this direction held little profit per sale. We needed a large enough market to survive and a profit-to-sale ratio to help us thrive. We discussed going to the third world where the roll cage look was conceivably less of an issue, but here again the numbers did not pan out. With the added shipping there was simply not enough profit for our projected price point. Throw away our whole consumer-based business model and marketing plan in favor of a new one. We asked the question: "What business are we really in?" The answer came when we researched educational markets such as high schools, tech schools and junior colleges. Here we found more than sufficient total available market (TAM) and dramatically higher profitability by adding an educational component, which we sold at a premium. We fell into a sweet spot between two rising tides in education: STEM – the science, technology, engineering and mathematics movement and project based learning – a highly popular hands-on approach to teaching. We found out we were really in the education business, not car (or motorcycle) making. As a result sales were easier to come by and hugely more profitable. Parker Compumotor's 6-K Controller product launch was a big step forward in technology for the company. The success of this new product was critical for Parker's step-motor control and industrial automation division. Tension was especially high due to the abrupt departure of the unit's marketing manager. Time was short and a lot of moving parts needed to be created and coordinated. Hire DeepSky Marketing's Jeffrey Schmidt to pinch-hit as an in-house division marketing manager while a new head of marketing was found. This move led to an extremely successful product launch and profitable rollout for this important new technology. In the 90's the managers of Heald's flagship campus in San Francisco wanted more students. Their career counselors were good at helping people see the benefits of the Heald education system. Simply put: they needed more leads. Jeffrey developed a direct response mail campaign that was so successful it was adopted in all 18 Heald campuses. For Heald, the direct mail approach worked better than their TV ads. Somehow filling out a card rather than calling a phone number from a TV ad made a substantial difference in the quality of the leads that were generated. As we tracked direct mail leads versus the ones from TV a pattern started to emerge. The leads coming from direct mail were about a third more likely to stay in school and graduate. Students responding from TV ads dropped out easily and more often. This had a significant effect on profitability between the two groups. 1) Filling out an inquiry form could mean the direct mail people were more studious and inclined to schooling. 2) Those who filled out a response card had to think about which programs they were interested in prior to sending in the postage-paid card. This allowed them to think things through — often putting pen to paper clarifies things. 3) The information on the card gave the counselor a more solid base to work with than a call from a TV ad. Why? Many times people feel pressure to say the right things when talking with a counselor. Filling out a form doesn't have this problem. The profitability of having students stay in school was more important than just getting a lot of leads in the door and having good looking sign-up numbers. This is a lesson in identifying the overall quality of a lead by tracking end-result profitability (aka the lifetime value) of leads coming into your company. This section could easily be called the benefits of a sales round table or leadership is best put into practice when everyone chips in. The people at Solar Works knew what they needed to do marketing-wise, but were not doing it — or much of it anyway. They wanted to get past the feast or famine of sporadic marketing, which lead to inconsistent income. Like many companies they would wait until a lull occurred before doing marketing and sales. There was a plan on their to-do list to implement a consistent marketing plan. That plan stayed on their to-do list. The Solar Works folks decided to try a new form of leadership experience: a Sales and Marketing Round Table. One of the defining aspects of a round table format is that ownership allows and promotes open conversation, totally open. Conversation is a very different thing than giving out tasks, collaborating on projects or developing to-do lists. We were successful at providing a level of trust that opened the group up for a genuinely open dialogue. In many cases our meeting agenda was ditched in favor of bold new directions that at first seemed like a waste of time. These later turned out to spark insight we never would have found if we'd "managed" our time and talk. Not only did we get new insights into what to do, we got into the nitty gritty of how to make it actually happen. We needed to address attitudes and change well-worn habits. As we made our plan we found an added bonus. Group connection was helping everyone stay on track. Each team member knew how their duties interrelated with others. This added fuel to the level of responsibility and support everyone felt. Specificity is not permissible in this case study as direct competitors may read this write-up. One of the testimonials from this team is below. You can read what the others had to say on the DeepSky Marketing "Testimonials" page. "With Jeffrey's excellent guidance the time invested in this process has produced huge dividends for our company by strengthening the cohesion of our team and honing our messaging . . . Thanks for your service to Solar Works!" "Jeffrey’s facilitation skills are golden. He makes our meetings about us, and what we want, and then gently takes us where we need to go with our marketing and sales. He helps us have authentic discussions about real issues. This leads to genuine solutions and an action plan that makes sense and involves all concerned." Geomancy is the Western art and science of "place-making." Like its cousin from the East, Feng Shui, Geomancy promotes well-being for people and planet with practical applications for where and how to locate your home or business and the belongings inside. The goal of Geomancy is to make people feel better. It is intricate, subtle and powerful. Selling the education and service of Geomancy requires honesty, authenticity and some measure of assertiveness. Richard "Feather" Anderson did not want to make his potential clients feel like they were being "sold." He recoils at the thought of being a pushy salesperson. Still, as a businessman, he wanted to market his business. Hire a guy who says he truly gets where he is coming from and stick a toe in the water of marketing and selling. The happy testimonial below explains how one client got to a place where he could market and sell and actually enjoy it. DeepSky Marketing's responsibilities for Bushtracks Expeditions were many and varied. We became their virtual marketing department, a title give to us by the owners. Direct marketing (outbound marketing) is important to Bushtracks, so is the internet (inbound marketing). Here is a partial list of how we helped this vibrant company succeed for more than 15 years. If you're in business you are going to need some portion of the list above (Ok, probably not the horse jump art). For your own sake please see that it is consistently branded for your company. If your company is not big enough to have an in-house marketing department, give us a call to discuss how we can provide what you need to succeed. “Bilgee” is a bilge pad for boats and he has a super power! Place him in the bilge of your craft and he will soak up oil to protect our waterways from petroleum contamination. Bringing Bilgee into being was a priority for state and local government agencies in California. With so many boats traveling our waterways the unintended build-up and leakage of oil is a very big problem. Did you know that just one quart of oil can contaminate up to a quarter million gallons of drinking water? Bringing Bilgee into being was quite a challenge. Not only had another company failed to create the essence of what needed to be conveyed there were a dozen heads of department’s chiming into the process in meetings, sometimes at cross purposes. Bilgee came into this world after a long and hard labor. As you can see Bilgee takes a stand for clean water. He also takes a stand for how simple it is to keep our waterways oil-free. It would be hard to come up with a better explanation for the process that brought Bilgee into being than the testimonial from our lead client (below). The results of this project are visible to your left. In our first conversation with Giselle Reeves (who has since past away) she was telling us about her business. Giselle was in the healing arts. Her method was to interview people about their situation and prescribe a program of relaxing massage and healing essential oils to address the issues that were identified. She didn't have a name for the process she was putting into practice. Some of her colleagues were calling it "raindrop therapy." That did not resonate with her or us. Giselle's main differentiator was the essential oils she used to help people with a wide variety of problems. In one of our interviews she explained that essential oils are very popular in Europe as a healing modality. They are used in hospitals and by most Doctors. They are called "sweet medicinals" due to their significantly positive attributes and lack of side effects. The name Sweet Medicinals certainly had a ring. It did not take much convincing for Giselle to fall in love with the name. Our big question was: is the URL available? We procured the URL for her and she fell ever-more in love with this wonderful name, as did we. A tag line sums up the benefits of a product or service. After having our windows cleaned we were struck at how much we were uplifted by this seemingly simple act. Sometimes the perfect tag line just comes, other times it takes a lot of work to make a good one. 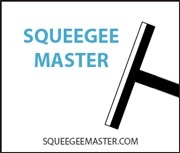 The tag line below just came and the people at Squeegee Master have been using it for more than 20 years. What Will Help Your Company Grow? Every business needs ways to attract customers profitably. Knowing who your product or service will benefit (your target audience) is paramount. In the first case study (at right) you will see how "knowing what business you are really in," reveals a target market that is right for your business, and how this can have a dramatic effect on sales and profits. When this happens there is a palpable feeling of relief, a lifting of stress. This is the foundation of your business.